The design objects created in the traditional craftsmanship following designers' ideas, need a space that reveals their beauty and usefulness. The aesthetics of these objects is different from that of industrial objects. These objects have the property of being beautiful in their imperfection, but also by the power of self transformation. Natural materials (wood, copper, brass, etc.) change their appearance over time, giving them a different and surprising look. These objects remind us of nature, naturalness, simplicity, non-material value, beauty of imperfection, integrity, calmness, intimacy. These objects appear modest but with confidence. Consequently, the space that shelters them must meet the same values and even be more modest and austere. As does the craftsman with his work, or the designer when thinking about an object, the visitor must be helped to have a close relation with the product. That's why I used earth colors and dark shades, for an intimate, relaxing, even melancholic ambiance. Space should not be more authentic than the products, space need to enhance the products. That's why all the crafted objects are placed on metallic structures to suggest their "moral and aesthetic" weight. The exposed objects are projected on a dark background, giving them elegance, freshness and shine. The worn-out patina finish on the opposite wall of the rack suggests the same aesthetics of imperfection and natural, beautiful degradation and change. 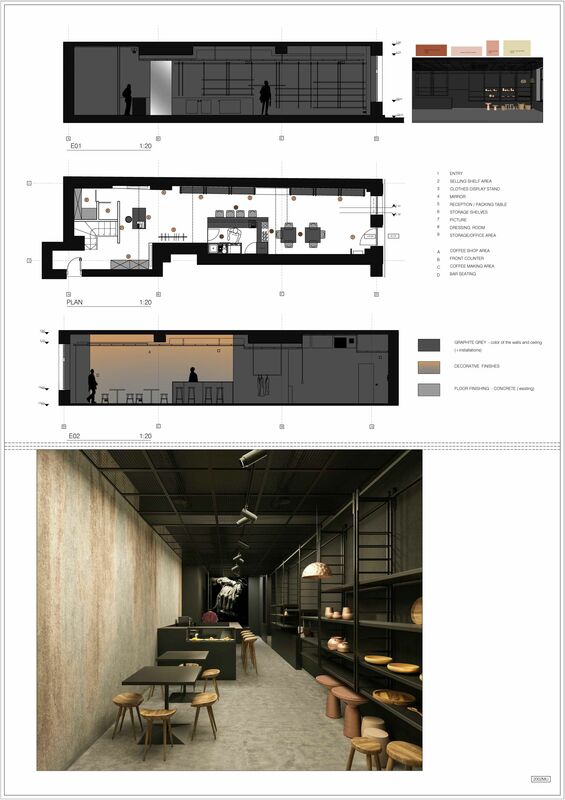 The coffee shop area is simple and discreet, while the smell of coffee must be the only source of olfactory sense activation, because the visual sense and touch are stimulated by the exposed objects. 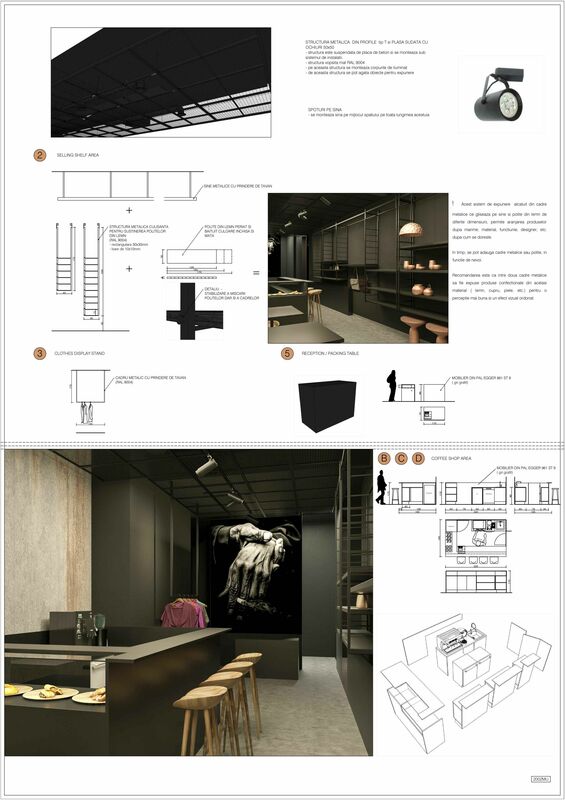 The oversized image/picture in the background is the only one in the design that has to attract the client attention, it suggests the beauty and the concern for craftsmanship and handmade work.